The Lockheed Electra Model 10 is most famous as the aircraft Amelia Earhart flew on her attempted around-the-world flight in 1937. As most people know, the aircraft disappeared somewhere over the Pacific Ocean with Earhart and her navigator, Fred Noonan. The location of Earhart's Electra has been a mystery ever since, though researchers in 2018 released a report claiming bones found on an island in the Pacific in 1940 are a match for Earhart. In 1932, with the expertise of renowned engineer Clarence "Kelly" Johnson, the Lockheed Aircraft Corporation designed the Lockheed Electra 10A, a state-of-the-art machine for its time. Lockheed intended the aircraft to be used ​commercially, and it could hold up to 10 passengers with a two-person crew. 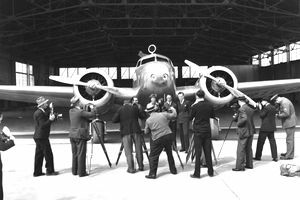 The Model 10 (not to be confused with the Electra L-188, a turboprop that came much later) was first flown in 1934, just three years before Earhart's famous last flight. Airlines that operated the Lockheed Model 10 Electra include Northwest Airlines, Braniff Airlines, Continental Airlines, Delta Airlines, Eastern Airlines, and National Airlines. The Model 10 Electra was flown by many international airlines, including operators in Brazil, Mexico, New Zealand, Canada, Australia, and the U.K. The military also favored the Electra. Argentina, Brazil, Canada, Spain, and U.K. militaries, as well as the United States military, had Electra Model 10 aircraft in their fleets. The Model 10 Electra was a twin-engine all-aluminum aircraft with retractable landing gear, variable-pitch propellers, and twin tail fins and rudders. The Lockheed Aircraft Corporation designed multiple variants of the Electra Model 10, ranging from the Model 10A to the Model 10E. The 10E model was given a more powerful engine and was the model flown by Earhart. The Electra was meant to compete better with other popular aircraft that were entering airline service around the same time period. The Model 10 Electra was smaller and cheaper to operate than competing aircraft made by Boeing and Douglas. As one of the first multi-engine aircraft used in the airlines, it did fairly well in a market flooded with single-engine aircraft. Johnson completed the wind tunnel testing for the Model 10 Electra and was responsible for the addition of the extra tail fin on the aircraft, which became a distinctive feature. Johnson then went on to take part in the designs of aircraft such as the U-2 and SR-71. Engines: The 400 horsepower Pratt & Whitney R-985 engine was installed on the Model 10A aircraft, and the 10E had the more powerful 600 horsepower Pratt & Whitney R-1340 Wasp SH31 engines. Earhart took delivery of her Model 10E Electra on her 39th birthday. It was given the registration number NR16020 and would be the airplane she'd attempt to fly around the world. She modified the aircraft dramatically for a long-haul flight. Fuel tanks were added to the wings and fuselage to accommodate for longer trip legs. After the modification, there were six fuel tanks in the wings and six in the fuselage. This allowed her to carry 1,150 gallons of fuel, enough for more than 20 hours of flight time at normal cruise. The aircraft also was equipped with better radio equipment—a brand new Western Electric radio and a Bendix radio direction finder, which were high-tech gadgets for the time period. One final modification included the addition of a Beat Frequency Oscillator (BFO) for Morse code capability. There are only a few Electra Model 10 aircraft left today. Most are on display at museums.